Four months shy from its second year, AfricLaw continues to remain a point of reference for issues concerning the rule and role of law in Africa. This would not have been possible had in not been for submissions from 16 different countries, spanning across 3 continents, addressing issues ranging from prisoners’ rights, taxation methods in Africa, to the right to education – all in an effort to create a dialogue and to foster an interest on matters that affect Africa. AfricLaw, as launched by the Centre for Human Rights and the Institute for International and Comparative Law in Africa, would like to extend a word of thanks to all contributors, visitors to the blogs, and those who have interacted with the blog one way or another. All your contributions are invaluable and we trust you will continue to support AfricLaw in the future. We furthermore wish to extend an invitation for further contributions to students, academics, researchers, international and national civil servants, legislators and politicians, legal practitioners and judges. 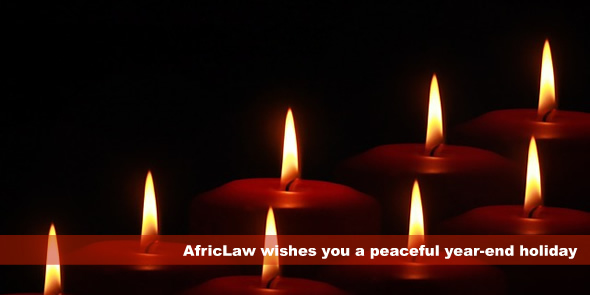 AfricLaw wishes you a peaceful year-end holiday and we hope to ‘see’ you next year when posting will resume (note that contributions are still welcome throughout the holidays). “You can have a Lord, you can have a King, but the man to fear is the tax collector”- Sumerian proverb. Today, fearing the tax man does not seem to hold true when it comes to the protection of taxpayers’ rights in most European countries. Indeed, for several decades now, taxpayers’ rights in Europe have been benefiting from internationalisation of human rights process. Under the impulse of case law from the European Court on Human Rights (ECHR) and the European Court of Justice (ECJ), human rights have become a fundamental part of taxation. While Africa is running the marathon of attracting and boosting private investments, it may be vital to stimulate the interaction of these two areas of law as a means to strengthen the rule of law on the continent. In Africa, tax is primarily regarded as a civic duty. Article 29 (6) of the African Charter of Human and Peoples’ Rights (hereinafter referred to as “the Charter”) states that “the individual shall also have the duty (…) to pay taxes imposed by law in the interest of the society”. It follows in particular that the state has the right to levy taxes on its citizens, whether individual or corporate. In contrast, citizens are entitled to enjoy property rights in respect of Article 14 of the Charter or any other pertinent instrument relating to international human rights law. Since the state and its citizens have opposing interests, a balance is obviously required between the individual’s right to property and the state’s right of establishing taxes. In others words, in case of a dispute regarding taxation, the judge should be able to censure any excessively high tax burden on citizens. The advent of the new 2010 Kenyan Constitution brought with it a promise of inclusive human rights enjoyment by making provision for socio-economic rights in Article 43. The entrenchment of the Kenya National Human Rights Commission (KNCHR) as an independent constitutional body, specifically tasked with the promotion and protection of human rights in Kenya, in terms of Article 59(1), further strengthened this development and promise. The KNCHR’s legal mandate, powers and the selection of commissioners is governed by the KNCHR Act of 2011. Realising the importance of having an institution that could independently work towards the promotion and protection of human rights in Kenya, the drafters of the Constitution opted to include the KNCHR in the final draft, with a mandate that was whittled down from what was initially proposed. Through the Act, the KNCHR was established as a successor institution to the one initially anticipated in Article 59(1) of the Constitution. The KNCHR is a National Human Rights Institution (NHRI), an institution formed by either a constitutional provision or legislative text to specifically promote and protect human rights. There are quite a number of similar NHRIs formed across the globe. NHRIs are non-judicial mechanisms that complement other arms of government in the fulfilment of human rights within a state. They are also an indication of a state’s commitment to use all appropriate means to realise human rights. The establishment of NHRIs is guided by the Principles Relating to the Status of National Institutions (Paris Principles) which, at a minimum, require that such an institution be independent (financially, operationally and legally autonomous); have a broad mandate; have a diverse membership; and given enough room to carry out their functions.